Donetsk - England scraped into the quarter-finals of Euro 2012 on Tuesday after a goal-line refereeing blunder helped them to a 1-0 win over Ukraine which sent the co-hosts crashing out. A 48th-minute header from returning talisman Wayne Rooney was enough to see England finish top of Group D and send them into a quarter-final in Kiev on Sunday against Italy. However Ukraine - missing injured captain Andrei Shevchenko - were unlucky not to have earned at least a draw after Marko Devic had a clear goal wrongly disallowed on 62 minutes. Devic had powered into the box and his looping shot had flown over keeper Joe Hart towards goal. John Terry launched himself into an acrobatic clearance to hook the ball away but despite furious Ukrainian appeals no goal was given. Television replays, however, showed the ball had crossed the line by several inches but had incredibly been missed by the additional assistant referee stationed behind the goal. It was a goal-line controversy that echoed Frank Lampard's disallowed effort for England against Germany at the 2010 World Cup and is almost certain to hasten the introduction of goal-line technology. FIFA is expected to approve the introduction of two systems which are currently being tested at a meeting after the European Championships. England will head to their quarter-final meeting with Italy chastened by the knowledge that on another night they could have been heading home after being outplayed for much of the match. England had ridden their luck in a one-sided first-half which Ukraine dominated, carving out a string of promising openings only to be denied by either desperate defending or the goalkeeping of Joe Hart. Rooney's long-awaited return to the starting line-up failed to galvanise the England attack as manager Roy Hodgson had hoped for, and the Manchester United striker looked hopelessly short of match-sharpness. All too often Rooney's first touch or timing let him down, a sure sign of the England talisman's anxiety and general ring-rustiness. That was best illustrated by the striker's failure to convert a golden English chance on 28 minutes, with an unmarked Rooney mistiming his jump to glance a header from an Ashley Young cross wide. Otherwise it was all Ukraine, who had started brightly with Denys Garmash letting fly as early as the sixth minute. Terry then had to be alert shortly afterwards, snuffing out the danger after Andrei Yarmolenko threatened to dart clear into the box. Scott Parker then hurled himself into the path of a Devic shot on 12 minutes as England continued to struggle to get in the game. Terry was pressed into action once again on 18 minutes when he blocked a shot from Yevgeny Konoplyanka with his shoulder as the Ukrainian onslaught continued. A Young mistake then let in Oleg Gusev, who cut in from the right and shot over the bar. A goal seemed to certain to come in the 30th minute when Artem Milevskiy released Yarmolenko into the area only for Hart to save well from close range. Yarmolenko then had the Ukrainian fans roaring in delight with a mazy dribble into the box that Lescott scrambled clear. But somehow England had managed to stay level at the break and then three minutes after the restart they got a goal that stunned the hosts. Steven Gerrard beat Yarmolenko down the right and sent a dangerous cross into the six-yard box. 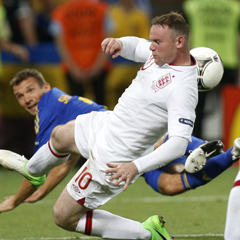 The ball took touches off two Ukrainian defenders before skidding through goalkeeper Andriy Pyatov to Rooney for the simplest of headers. Yet Ukraine fought back brilliantly, with Milevskiy heading just over the bar on the hour mark before the flashpoint involving Devic and Terry that ensured the headlines would be dominated by the goal-line technology debate. Shevchenko's arrival from the substitutes bench on 70 minutes threatened a revival but there was to be no fairytale ending for the veteran striker as England hung on desperately.